Two Maryland men were charged and arrested, amid allegations they fleeced 21 Michigan churches out of $660,000 in a Ponzi and affinity fraud scheme in which pastors were duped into giving a leasing company access to church bank accounts. Authorities said the men perhaps targeted more than 160 churches in 13 states and the District of Columbia. Investigations in multiple jurisdictions are under way. Meanwhile, a Pennsylvania man has been charged with bilking credit unions in three counties out of $2 million in a Ponzi scheme involving certificates of deposit. In the Michigan case, Michael J. Morris and William T. Perkins were charged Oct. 5, but remained at large. They were arrested Oct. 9, and arraigned in Wayne County, Mich.
Morris and Perkins were charged with multiple felonies, including one count of Conducting a Criminal Enterprise (Racketeering); one count of Conspiracy to Commit False Pretenses Over $20,000; four counts of False Pretenses Over $20,000; and four counts of Fraudulently Obtaining a Signature. Michigan Attorney General Mike Cox said Morris and Perkins were representatives of Television Broadcasting Online and Urban Interfaith Network. The scheme involved obtaining money from leasing companies and making churches responsible for repayment of the funds through brazen deceit, Cox said in a statement. Although the kiosks were worth about $2,000, the scammers inflated the price to $27,000 and sold the agreements they’d fleeced the churches into signing to a leasing company, prosecutors said. Despite the fact Morris and Perkins promised the churches a “national sponsor,” no such sponsor existed, prosecutors said. The fraud morphed into a Ponzi scheme when the duo took some of the proceeds and applied them to initial payments due on the machines, pocketing the rest, prosecutors said. Cox said the crime was disgraceful. 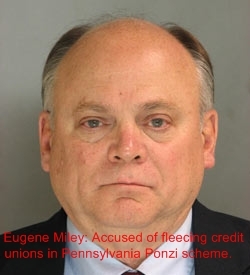 Eugene D. Miley, 58, of Beaver, defrauded credit unions in Armstrong, Westmoreland and Luzerne counties out of $2 million in a Ponzi scheme, said Pennsylvania Attorney General Tom Corbett. Miley served as a financial broker for clients, “offering to locate and purchase high-interest-rate certificates of deposit (CDs) for those institutions,” prosecutors said. “Instead of purchasing CDs, Miley allegedly diverted the funds for his own personal use, depending on new credit union purchases to pay-off older fictitious ‘investments,'” prosecutors said. It was all smoke and mirrors, Corbett said. Miley, prosecutors said, sold $2,080,000 in fictitious CDs between 2006 and 2008, including $1,387,000 to Moonlight Credit Union in Worthington, Armstrong County; $594,000 to VANtage Trust Credit Union in Wilkes-Barre, Luzerne County; and $99,000 to Stanwood Area Credit Union, in New Stanton, Westmoreland County. The scheme centered on Miley’s ability to trade on trust, Corbett said, noting that Miley had longtime business relationships with each of the credit unions. Investigators determined that Miley was not licensed to operate as a financial investment company, financial adviser or financial products dealer in Pennsylvania. He was charged with multiple felonies, including one count of securities fraud; one count of selling unregistered securities; and three counts each of theft by deception and theft by failure to make required disposition of funds. Although Miley posted bail, which had been set at $50,000, he was placed on electronic monitoring and ordered not to leave Pennsylvania. It takes a special kind of person to steal from a Church. And an even more special person to invoke God in their scam. It is still stealing, which I remember it being one on God’s Top Ten List of Thou Shall Not’s.